Does My Student Have Dyslexia? Minds in Bloom is thrilled to have Dr. Erica Warren back to the blog today. Dr. Warren is sharing information about screening students for dyslexia and how to support them if and when a formal diagnosis is given. Continue reading to learn more! When considering the estimates that 1 in 10 people have dyslexia and that there are successful teaching methods available for this population, one might wonder why our education system does not have standard practices to identify and help these students. In addition, with the new research suggesting that students with dyslexia also exhibit cognitive-based strengths compared to those without dyslexia, perhaps one might consider it to be a learning difference and not a disability. Sadly, without a diagnosis in hand, our current education paradigm dooms these struggling learners to maintain the same ill-instruction. With a Whole Classroom of Students, How Can I Help? Have you ever come across a bright and creative student that is struggling in class? Reading is labored, decoding is difficult, spelling is poor, writing is challenging, and their grades just don’t reflect their abilities? Did you ever wonder whether he or she may have dyslexia? With a large classroom of students, it can feel overwhelming to assess and address the needs of a single student. However, you can help all your students receive the needed attention and accommodations so that they can reach their true potential. 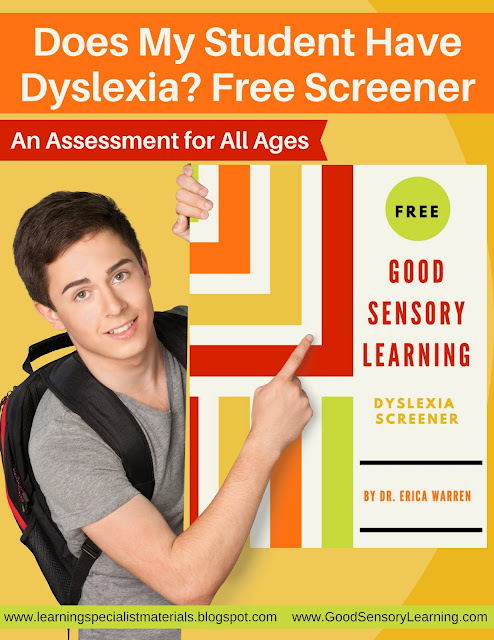 Use the free Good Sensory Learning Dyslexia Screener. This quick 20-question assessment can be administered and scored by a parent/guardian or a teacher, or it can be taken by the individual who may have dyslexia. This will help to determine whether there is enough symptomology to warrant formal testing. Ask the parents to request formal testing through the local school district for students 18 and under. For older individuals or when testing outside the school system, local professionals can administer the needed tests. One place to find these experts is through the International Dyslexia Association provider directory. 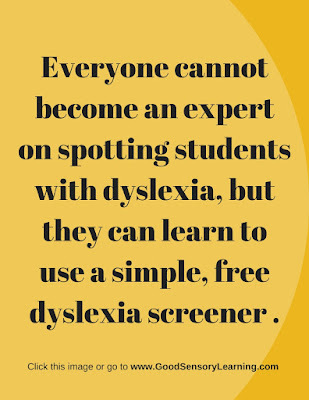 If the individual in question does not require educational or workplace accommodations of any kind, then the Good Sensory Learning Dyslexia Screener can be used as an informal evaluation. After a formal diagnosis has been made and properly documented, one may contact one’s school or workplace and request a meeting to determine “reasonable accommodations.” Please note that the DSM-5, published by the American Psychiatric Association (APA), is the manual that is used to diagnose disabilities. It includes codes for all mental health disorders. At present, dyslexia falls under the category of Specific Learning Disorder with impairment in reading. The Good Sensory Learning Dyslexia Screener is a 20-question screener that offers a simple Likert scale assessment that addresses all the common symptoms revealed in the research. It is an informal evaluation and is best used to indicate whether formal testing should be pursued. CLICK HERE to download your free copy. Once Diagnosed, How Can I Help a Student with Dyslexia? If you would like to learn about products that can assist with the remediation of dyslexia, then CLICK HERE. Dr. Erica Warren is a learning specialist, an educational therapist, and an author of multisensory and mindful educational materials. She resides in New York, where she works one-on-one with students as a “personal trainer for the brain” and as an educational consultant/teacher trainer. Dr. Warren offers multisensory materials at GoodSensoryLearning and Teachers Pay Teachers, as well as courses for tutors, educational therapists, and learning specialists at Learning Specialist Courses. You can read her popular blog here.